Many of us these days have some sort of Internet service and basic computer network in our homes. Newer houses often come “pre-wired, ” but adding the wiring you’ll need isn’t too complicated either. But whether you’re going wired or wireless with your setup, you’ll still need a fair amount of wiring. Here’s a closer look. The main thing you will need for a home computer network is some Ethernet cabling, also called “Cat-5” or Category 5 wire. This is a multi-strand cable that can route data, voice and video from your Internet Service Provider (ISP) throughout your house. You’ll need some even if you’re installing a “wireless” network – the wireless portion really only refers to your computer, which has a transceiver built in. Once the signal reaches the network, it travels through the Cat 5 cable. Your ISP typically provides a modem inside your house. You may connect a computer directly to the modem with Cat 5 cable, or use this cable to install one or more Wireless Access Points in the house. Your installer may need to drill into walls and floors to get the wiring to where you need it; wireless access points provide good coverage but sometimes walls (especially stucco) will weaken their signals. To have basic wiring installed for this, expect to pay from $78 to $487. 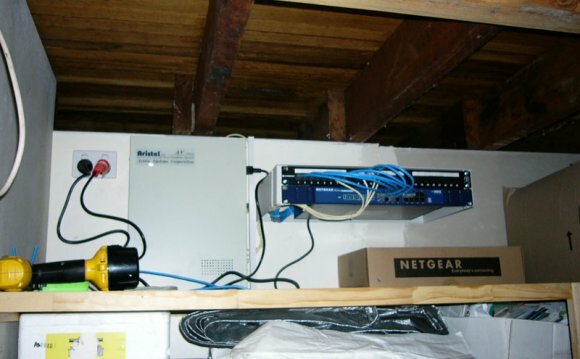 You may have some computer wiring already in your house – for example, there have been some networks that used standard phone wires or even the power lines within the house, but generally speaking, Ethernet cabling is preferable to these as it can provide faster service and accommodate more types of data. The good news is, if wiring is already installed, your installer can often use the same holes, routes and brackets to put in new cabling. Expect to pay from $88 to $314 for a typical house computer rewiring project. As discussed above, many home networks include a wireless access point which provides decent service for about 300 square feet. However, sometimes a wall can block the signals, or you may want a “dedicated” socket for a computer that’s used for heavy data or video service. It’s not always necessary to wire the whole house, but if you do, you will have more options. For just two or three rooms, you’ll typically need to spend $162 to $247, where for an entire house (figure six to seven rooms with Ethernet receptacles in each), expect from $418 to $837. Installing the wires for a computer network is similar to putting in telephone lines. They travel from the modem, which is the basic entry point of your house to the larger network supplied by your ISP, to various points within the house. To install these, your contractor will need to drill into walls, pull cable through to the next access point or receptacle, or possibly through floors and under the house to bring access points other parts of the house. In some cases they may need to install plastic piping called conduit, through which the cabling will run. A basic installation of wire, including testing, will typically run $107 to $542. A business computer network is typically called upon for heavier duty than a standard home network, as many businesses need to transfer large files or have constant access to information. The wiring is similar but because there are often extra devices such as printers, fax machines, scanners, phones and tablets, your contractor will likely need to add a router to the network. This device, attached via Cat 5 cabling, connects to your modem and creates different Internet addresses for each device on your network. Because the Cat 5 cabling can handle all types of data, voice and video, you won’t need to add a whole lot of extra cabling for a business setup, just perhaps 20% more than a regular home network. For the router and the wiring, expect to pay $238 to $674 on average.